A Catholic woman has raised nearly £500 for a charity helping persecuted Christians by taking her 14 dogs on a sponsored walk along the Wirral coast. Rachel Buckley trekked for 15-and-a-half miles to raise the money for Aid to the Church in Need’s work with refugees in Syria. She chose Sunday October 4, the date on which the Feast of St Francis of Assisi is usually celebrated, because she also aimed to draw attention to Laudato Si, the encyclical letter of Pope Francis to humanity on the care of the environment. 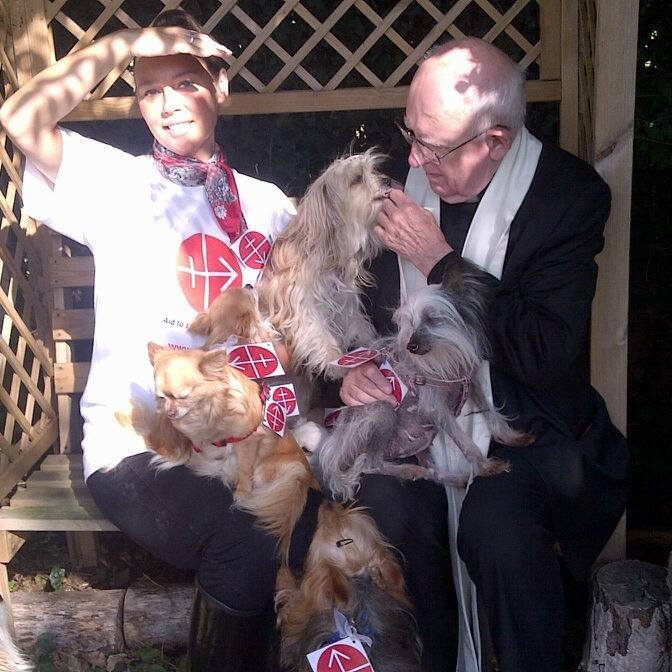 Canon Brendan Hoban blessed each of the dogs at Rachel’s home in Bidston, Wirral, before they set off on the Wirral Coastal Walk. The dogs include a blind Chinese Crested called Xia and Yorkshire terriers and Chihuahuas among other breeds. The walk was initially meant to cover 10 miles but detours forced Rachel and her pets to cover nearly 16 miles, walking from 11.30am until after 7pm. “It was a beautiful day but I was completely exhausted at the end of it,” said Rachel, who works in administration department at the Diocese of Shrewsbury curial offices in Prenton. “We were shattered when we got back because it took all day,” she said, adding that all of the dogs, including Xia, the blind dog, completed the walk. Rachel said she believed that the work of the charity was vital not only because it helped to relieve acute suffering but because it also offered the hope to the Christians of Syria and of Iraq that they might eventually be able to return to the homes they have been forced to flee because of war and terrorism.